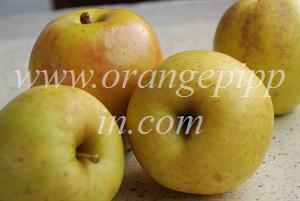 GoldRush is an attractive smooth-skinned modern dessert apple, specifically developed for scab-resistance. The flavour is good, typical of Golden Delicious but with a bit more acidity. As a relatively new variety there is not much experience yet, but it appears to be good at most of the things Golden Delicious is good at, including keeping well and with excellent juice. The variety is derived from Golden Delicious as the seed parent, with crosses from several other research varieties including Winesap, Melrose, Rome Beauty and Malus floribunda - the latter being a well-known source of the Vf scab-resistant gene. More details of the scientific programme that led to GoldRush can be found at the Purdue University website: http://www.hort.purdue.edu/newcrop/pri/coop38-3.html. GoldRush is sometimes known by its programme reference Coop38. GoldRush makes a good garden apple variety - heavy-cropping, good disease-resistance, winter-hardy, and almost foolproof to grow. Its one drawback is susceptibility to Cedar Apple Rust (CAR). découvert chez un petit pépiniériste du Nord de la France, celle ci présente l'avantage de pouvoir se consommer sur l'arbre tout l'hiver! elle n'en sera que meilleure puisque qu'elle sera moins acide ! l'arbre est de bonne vigueur , de type IV de fructification, la pomme peut présenter des points rouges qui sont une forme de résistance à la tavelure. en revanche à tendance à se friper dès le mois de février dans les caisses même si bien conservée. I found a Farm shop here in the UK that had some of these apples for sale. Now its 16th April and was suprised to see an apple available so late. Its a wonderful tasting Apple very tart and sweet. I agree that it is a great apple. I find it to be a little small (thinning doesn't help much), and the apple is not especially attractive. It wrinkles in storage like Golden Delicious, so I plan to start storing in plastic bags. Just tried this apple from a Gift box from Cummins Nursery, Wow, what flavor! Love the sweetness with just enough acid to blend. My favorite apple so far! Found at fruit stand here in Central VA. Delicious apple, crisp and flavorful. Reasonably priced at 1.29 per pound. A PA based apple grower at my local farmer's market has been selling these the past few years. Probably the best apple I've ever had. Wonderful flavor. Our first crop of Gold Rush was just picked at the end of November here in Oregon. It's already a favorite! Both tart and sweet, with a pleasing late season crunch. Wish we had enough of them to make cider -- time to plant a couple more trees of this variety. Why on earth would you eat a Golden Delicious when you could eat one of these?! Tried a small one from an organic farm in Kansas in early November. Juicy, crisp, and intensely sweet, balanced nicely by acid. We pick this apple in early November and put it in bags in a detached and unheated garage (that doesn't get too far below freezing). The apples finish ripening off the tree (in our garage) in December and January. We don't bother eating them until January after the flavor develops. The apples are excellent until we run out of them in May. Even when the outside gets wrinkled in later storage, the inside is still juicy and intensely flavorful. Even the wrinkled skin is nice to eat because it's not waxy. We're going to plant more of these trees. These are the tastiest apples I have ever tried! The local Farmers Market had samples and I am hooked. It is almost summer and these apples still have terrific flavor. I am wondering if the flavor is still this good so long after harvest, when they are fresh, would the flavor be too intense? An excellent apple and an excellent tree for home orchard. Very easy to grow. You will need to spray for cedar rust if you have cedars nearby and they are prone to late summer diseases (Sooty blotch and flyspec) if the weather is wet. Wonderful tasting after storage for 6 weeks or more and stores exceptionally well. Makes one of the best pies I've ever tasted. A wonderful apple in VA, intense flavor and very firm dense flesh that keeps forever. My two young trees seem to be very disease resistant and manageable. Nice deep green waxy foliage like many of the more disease resistant cultivars. Goldrush apples are great here in eastern PA. They are by far the favorite apple of our family. The trees bear young and heavily. A real winner in a backyard orchard. this is an amazing apple that we buy by the crate from a local apple farm. Where can we buy some young trees of our own here in France? Tried this apple at Century Farms Orchards in NC. It is now one of my new favorite apples. It is nice crisp apple and is very sweet with a very rich, complex flavor. Where can I buy a gold rush apple tree in Belgium? Developed by: Joint breeding programme of Indiana, Illinois, and New Jersey Agricultural Experiment Stations.